About: The Scolt Head Pub serves a selection of alcoholic beverages as well as food. There is also a games room in the pub with a pool table. There’s something about the name ‘De Beauvoir’ that oozes class and sophistication, yet remains just a touch, playful. The good news for locals and roast hunters, The Scolt Head is a little of all that itself. Great for big groups, fine for intimate occasions and in possession of a large football room out back. The roast bests its weekday menu with great quality meat and a killer horseradish sauce. 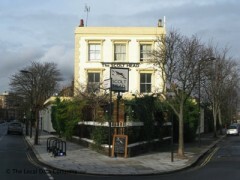 The Scolt Head is a lovely pub in the heart of De Beauvoir Town. To add to its fine Sunday lunch, good range of ales on draught and its rosy atmosphere, there is a spacious football room at the back. A projector screen plays to rows of battered leather sofas and more formal tables and chairs. "Sunday lunchtimes are as relaxed as the Friday nights are fun"
Everyone’s talking about De Beauvoir and for those who can’t afford to live in one of its plush houses, there are always its fine pubs so you can pretend that the area’s yours. The Scolt Head is one such pub, located on its own corner just north of the square, complete with its own terrace out front that comes with thick spruces for shelter. Inside, the space is a sprawling collection of the usual heavy wooden tables, mismatched chairs and random trinkets from taxidermy to watercolours on the walls. The Scolt Head’s website claims that they didn’t want to turn the place into just another gastro pub, but they have and that’s nothing to feel bad about. The atmosphere is what’s important and in a place where Sunday lunchtimes are as relaxed as the Friday nights are fun, the balance is pretty much spot on. It can at times feel uber middle class with bearded graphic designers and bugaboos at every turn but that’s East London for you. The food is pricy but not outrageous in comparison to some in the area and the quality of the ingredients means you’re getting what you pay for. The Sunday roast is as good here as anywhere and look out for its rib-eye steak for a treat. There is a good range of wine and in keeping with the pubby attempt there are always good ales. Where the Scolt Head rises above other gastro pubs is that despite its foodie credentials it feels fine just to pop in for drinks, either inside or in the excellent beer garden. Lovely local pub it's just a shame there isn't a bit more adventurous range of beers on tap. The back room is always a good bet for football though and the roasts are excellent.